The LA Times featured some more outrageous pricey gift ideas in the Brand X blog today. For more extremely opulent fish tanks visit the store site opulentitems.com. To: The person who has everything. From: The person with really deep pockets. 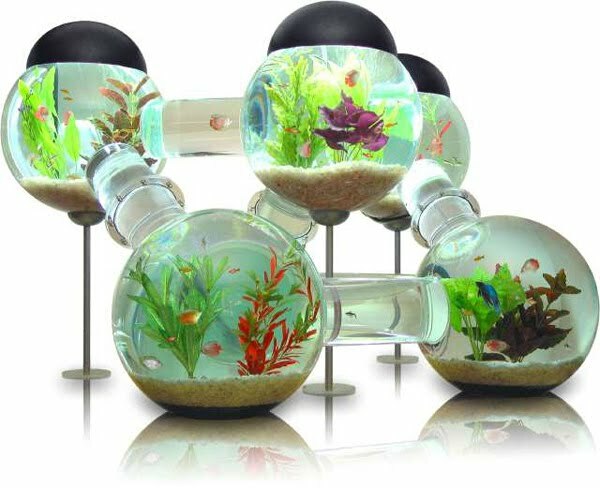 If a fishbowl is akin to a shack and the traditional aquarium is a house, then the Labyrinth Aquarium is like the sprawling Spelling Mansion. If a fish doesn't like the scene in one Lucite acrylic aquarium bowl, it has several others to choose from. Seems like the fish would all gravitate to one sphere . This is magical but looks a whole lot like the chemistry lab gear I used back in undergrad... I wonder if you could DIY it with chem lab gear? Looks like an accident waiting to happen, but it's so neat!!!!! Can't stop staring!